After 3 straight months of gains, the Pending Home Sales Index slipped 1 percent in July. The monthly report is published by the National Association of REALTORS® and measures the number of home under contract to sell nationwide. The Pending Home Sales Index is closely watched by Wall Street and analysts because it’s a forward-looking housing market indicator. Unlike most housing market data, though, Pending Home Sales forecasts a future housing market event. In this case, the Existing Home Sales report. In its methodology, the Pending Home Sales Index states that 80% of homes under contract close within 2 months, with most of the remaining home going to closing within Months 3 and 4. We would expect home sales data to taper into the fall buying season, but this year, they may taper more than normal. This is because, in a separate report, the National Association of REALTORS® said that contract cancellation rates are running high. As compared to a 4 percent contract cancellation rate in May 2011, June and July both registered 16 percent. This means that fewer homes tallied as part of July’s Pending Home Sales Index will show up as “closed sales” this fall. Contracts can be canceled for any number of reasons including more stringent mortgage guidelines, appraisals falling short of the purchase price, and changing mortgage loan limits. 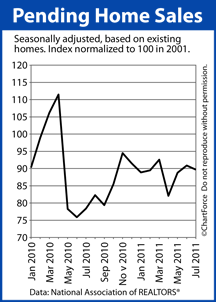 For home buyers in Corpus Christi , the Pending Home Sales Index may represent an opportunity. Not only are fewer homes going under contract nationwide, but with cancellation rates spiking, sellers may be more willing to “make a deal”. Note, though, like all real estate, the pace at which homes go under contract is a “local” statistic; you can’t assume national data applies to all markets equally. Your home market, for example, may out-perform — or under-perform — the national average. For a closer look at what’s happening on your street including the speed at which homes are selling, talk to a local real estate agent.